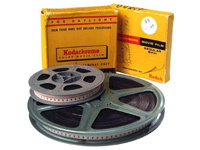 Introduced by Eastman Kodak in the 1920's, this film format was initially targeted at the home enthusiast. My grandfather had a 16 mm camera (pictured on the right) and I've converted a number of his old reels that he had spliced onto larger reels. This film is wider and came with an optical sound track (if you had the extra money for it) and in the 1930's was making huge inroads into the educational market. The professionals always considered this format to be inferior but it was used extensively during WW2. Over a period of many decades, the dyes in color 16mm film slowly degrade and become transparent. The dyes degrade at different rates with magenta being the longest-lasting. This inevitably results in color film that now appears to be reddish, with few other colors. In the process of digitizing old film into a modern digital movie format, the faded film can sometimes be restored to full color with the use of digital color enhancement methods that amplify the faded dye colors, but do not amplify the red dyes. 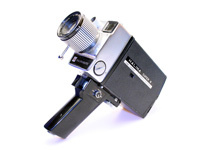 8 mm film was a popular format during the 1950's and on. 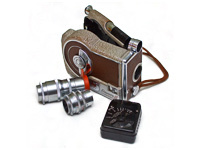 It was in colour but the reels were small as the film pack had to fit inside the 8mm movie camera. 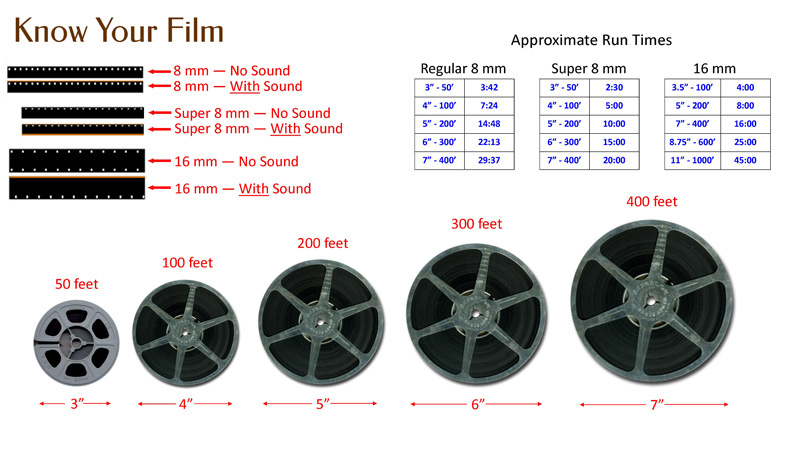 It was up to the consumer to have the small 3" reels spliced onto larger reels. 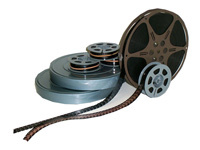 We never pursued the splicing process and just kept feeding the 3 minute reels into the projector one at a time. The projector bulb was expensive and very very hot once it started up as it needed to project the image up to 30 feet away onto either a screen or a wall. Being projected that far away allowed the watchers to NOT see all the imperfections in the film itself. During the developing process (you mailed your film back to Kodak to be developed) the film is run through various chemical baths for set times and unfortunately the developers would try to get as many films through their baths as possible. One of the critical chemical baths was 'the fix' - chemicals that 'fixed' the images onto the film and if this chemical was weak (due to the large number of films that had already used it) your images would begin to deteriorate slowly over time and the dominant colour would saturate the rest of the colours. The other issue with using a projector was that if the film jammed the bulb would melt the film for about 3" either way and the sprockets could rip through the perforated edges of the film.